Do not daven slower or faster than what is acceptable. Do not place "a burden on the congregation." If you daven too slowly you will cause others who have to go to work to leave before the end of the davening, and you will delay the next minyan from starting on time. If the someone davens too quickly, do not admonish him in the middle of the davening and embarrass him. Talk to him as a friend after davening. If speaking to him gently does not work, do not ask him to lead the davening. Use the accepted tunes of the community. Do not use tunes with which the community is not comfortable. This causes the community distress, besides the halachic question involved in acting this way. If the person leading the davening acts differently than the accepted practice, please do not embarrass him, as we said above. If you ask your guest to lead the davening, advise him of what is expected of him in order to prevent unpleasantness. Do not bring young children who cannot remain quiet. It is permissible to bring a quiet child. If he begins to make noise please take him out immediately, even in the middle of the Shemoneh Esrei, and especially in the middle of the Shemoneh Esrei. Please take an urgent conversation outside, and "Hashem, the Beneficent One, will forgive." If you talk inside and disturb others who are davening, however, it is not certain that they will forgive you. If the conversation cannot be delayed and it is impossible to take it outside, please whisper and "Hashem, the Beneficent One, will forgive." Close chairs and folding shtenders quietly without banging them. Shul is not a welfare office. Pay your dues and donations, and do not perform mitzvot with money that does not belong to you. Do not make a long "Mi She-beirach," no one listens. A blessing will come to someone who is strict to forgo a "Mi She-beirach." Donate money when you receive an aliyah, and I promise you that the Master of the Universe will bless you even without the Gabbai's announcement. If you are late, repent. Do not organize a private repetition of the Shemoneh Esrei which prevents others from leaving and places a "burden on the community." Do not shout out "Yasher Koach" to people who receive an aliyah or lead the davening. They will be happier to receive a personal "Yasher Koach" with a smile. Try, as much as possible, to hang announcements on the bulletin board. Conversation and the usual "jokes" are usually at the expense of the repetition of the Shemoneh Esrei and others people's ability to concentrate. The Silent Shemoneh Esrei is exactly that: Silent. Our Sages said that one should not daven the Shemoneh Esrei out loud in the presence of others, since a person is not permitted to increase his own concentration at the expense of another person's concentration. Do not clap your hand in the middle of the Shemoneh Esrei "to expel external distractions." Ask Mekubalim (mytics) how to attain this result without making noise. Smile at him, extend a handshake and greet him. 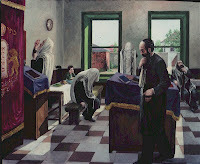 The usual crowd in shul should also be viewed as a new face. The merit of forgoing it will benefit the ascension of the soul of the deceased even more than the merit of prayer. Do not walk in late and do not leave until it is over. If you are looking for challenges in mitzvot between one person and another – come to shul. If you are looking for challenges in mitzvot between a person and Hashem, fulfill these mitzvot between one person and another. They are also the will of Hashem.